Charles J Marshall (Aberdeen) Ltd celebrated its Diamond Anniversary in 2012. Sixty one years ago, the Marshall brand was conceived by Charles J Marshall. Now producing well over 2000 units per year and with an extremely efficient factory, Marshall Trailers have invested heavily in modernizing the production process in order to stay at the forefront of trailer design and quality. Marshall Trailers produce on average 46 units per week that are sold throughout the world and can proudly boast that they are the UK’s oldest and largest trailer manufacturer. The BC range are heavy-duty trailers, which benefit from a hugely over-engineered chassis and improved running gear. It has box section bearers and runners which provides exceptional strength and prevents water from prematurely rusting the trailer. The standard floor is a 4mm durabar floor that significantly reduces the potential for loads to move during transport. With harvest ladders as standard, they are capable of carrying all types of load safely from the moment it is purchased. The BC range is built to last, with a robust chassis and upgraded running gear to ensure customers won’t be disappointed. The Marshall feed barrier range is built to the same standard as the rest of our product ranges, with strength at the core of the design. The frame of our feed barriers are constructed using box section with 5mm steel ends that are fully welded to provide improved rigidity and strength. The sides and floor are formed from 30mm treated pine that can be easily replaced when eventually worn away. The TB/6 model is 6 metres long and has 16 feeds spaces to allow cattle easy feeding. Designed for both indoor and outdoor use with a shot-blasted and dual layer paint finish to provide excellent protection from the elements. The Marshall feed trailer range combines a unique, practical design with exception built quality. In addition all our feed trailer have a number useful features integrated into the design including a timber slatted floor, removable drawbar, swinging tail door and angled sides to assist feeding. Available in two sizes of either 15 or 20 foot, which have either 32 or 40 feed spaces. The HD hybrid dumper ranger has been designed to combine strength and durability to provide a tough trailer with a generous capacity. The result of this design is a trailer that can be used for stone and rubble, but also bulkier loads such muck. It has an 8mm floor and 6mm sides, which forms an extremely robust body that can cope with carrying rocks and other heavy loads that could potentially damage a lighter trailer. To further enhance the trailer’s strength the tipping points are 50mm thick. The chassis on this model uses the same design as our QM. The large capacity and upgraded running gear means the HD range is ideal for tackling all the tough and difficult jobs around the farm. The livestock trailer range are built to an extremely high standard with functionality and practicality at the core of the designs. The two options that are available to customers are a stand-alone container or a container permanently fixed to a trailer. Both have a durabar floor, aluminium ramp complete with helper springs and internal dividing doors that can be set every 18”. In addition, all models can be fitted with optional sheep decks, which can also be easily stored within the container. The usual high-quality Marshall build and flexible model options means the Marshall livestock container range is an excellent choice when transporting cattle or sheep. The convenience of having your own Marshall livestock container will surprise even the most sceptical of owners. The MS range combines a excellent carrying capacity with usability. The range uses a 4mm drum and 6mm ends, which is hugely over engineered for the size of the spreader and therefore drastically improves its lifespan. The chains are case hardened flail chains with fully-welded heads, not simply held on with a bolt or pin; this significantly reduces wearing of the chains and chain heads. These are mounted on four sides of a perfectly balanced main rotor, to help create a more even spread pattern. All bearings on Marshall spreaders are also mounted away from the drum limiting the potential damage from corrosive slurry. The spreader lid is opened by a hydraulic ram which is made from stainless steel to eliminate corrosion. The overall strength of the spreader is further enhanced by the Marshall integral chassis design that has been used for over 30 years. The MS range combines an excellent design with a compact size to provide an extremely flexible machine that can handle the rigors of the modern agricultural industry. The Marshall QM/12 is an excellent all round trailer that can handle cereal, silage and root crop work due to its long, low design. The body is constructed with 4mm sides and a 5mm flat floor, complete with a generous number of spacers and bearers to guarantee durability and strength. The chassis on the trailer is Marshall’s own unique design, providing the perfect blend of strength and flex. The chassis is formed from a 6mm sheet welded over a heavy-duty channel, providing immense strength and simultaneously allowing the chassis to flex. The design of the QM range means it is an excellent all-round trailer that has the capacity to tackle major jobs, without any issues. The S drop side trailer range provides an extremely flexible design that can carry out a huge variety of jobs effectively allowing the trailer to be used as a flat-bed or a proper trailer. This drastically increases the jobs this trailer can be used for, whether it is moving pallets, small machines, sand or grass; it really can handle all jobs. There is also the option of mesh, grain or silage sides making it an even more versatile piece of kit and maximising the trailers functionality. The body of the S range has a 4mm floor and 2.5mm sides in two panels, still allowing them to be easily removed if necessary. 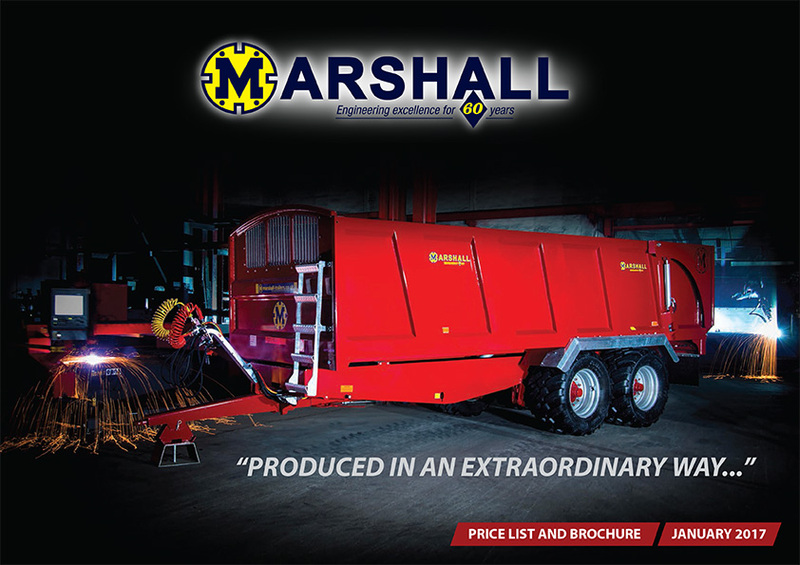 The Marshall S/85 is a multi-purpose trailer that performs extremely well in a number of different roles and easily meets the challenges of the modern agricultural industry. All Marshall tankers have an integral chassis design to reduce stress on the tank and prevent premature cracking. In addition, the tank is constructed from 6mm steel, which improves durability and increases the lifespan of the tanker. The tank has also been measured to ensure that it will hold its stated capacity and customers receive exactly what they paid for. The standard 10000L Hertell pump provides quick and efficient loading of the tanker, while combining reliability and durability. With the option of up to 750/60 – 30.5 tyres, this provides fantastic floatation on soft ground and significantly reduces the damage done to the ground by the tanker. With a huge range of options the ST range ensures there are few jobs it cannot handle. The whole concept behind the Vesuvius Vantage (Rear Discharge Spreader) was based on the premise that a spreader was required in the marketplace that should be virtually maintenance free. The VES range requires a daily visual check of the gearbox oil level and greasing by means of five remote points. Quite simply that is all that is required. This was made possible by developing a unique design that uses a hydraulic ram to push the load to the beaters, eliminating unreliable and troublesome chains that are a notorious weakness of rear-discharge spreaders. The pushing rams speed is fully controllable ensuring a constant speed of discharge. The removal of a chain drive system allows a deeper, more compact design that has a lower centre of gravity making it an ideal choice for areas with narrow roads or for spreading on hills.